Passing Modern Botany on Schull’s main street, you’d be hard pressed to guess it was a beauty emporium. With no flashy advertising or smiling, photoshopped faces, its large window reveals a tiny shop space with a small table of products on display. It’s as far removed as you can get from the barrage of imagery and products that greets you in any department store or high street pharmacy. Inside, behind a partition wall, around a communal table, sits the Modern Botany team, alongside founders Simon Jackson and John Murray. As CEO, John is frequently on the road meeting retailers and customers and, as chief scientific officer, pharmacognosist Simon is usually found in the lab, researching ingredients, rigorously testing their efficacy, and formulating new products — one of which they’re here to tell me about today. No stranger to natural skincare, Simon was the founder of Dr Jackson’s, a renowned natural skincare line for which John served as business development manager. Partners in business and in life, with “a draw to west Cork” and a desire to start an Irish natural skincare brand, the pair moved from the UK to Schull in 2015, making their home in a small farm holding in Lowertown, overlooking the Atlantic sea. If less really is more, Modern Botany are on to something big, championing an approach to skincare that’s the antithesis of the multi-step regimens currently advocated by the beauty industry (all the better to sell you more products, my dear). Instead of launching with an array of lotions and potions, they entered the market in 2016 with a single product — albeit one that quickly gained cult status. In an industry fixated on newness, that generally likes to tell consumers what they need now, and why, rare is the brand that takes the opposite approach: launching one highly effective, unisex, multi-use product, then waiting for customers to tell them what else they need. But flipping the cosmetics industry on its head is what Simon and John are here to do; that they’re doing it from a little HQ in on the main street of Schull is just part of their charm. “We’re not interested in this idea of one cream for your nose and one for your chin,” Simon adds. “We’re not that kind of company. We make something because there’s a need for it, and it sells because it works.” It’s a refreshingly radical approach. As John explains, having worked in the industry for so long, “we wondered why there were so many products doing so many different things, when one or two could do a multitude”; and that ethos chimed with their focus on sustainability and socially, ethically and environmentally conscious consumerism. They developed a natural oil that could be used on face, hands or body, for cleansing, moisturising, priming skin, or sealing makeup. Safe to use on babies, effective on skin conditions like eczema and psoriasis, it’s even recommended for cancer patients undergoing chemotherapy. “We developed it as a replacement for other things on the market,” Simon tells me. “Petroleum-based oils intended for pregnant women, which were the worst thing they could be using. 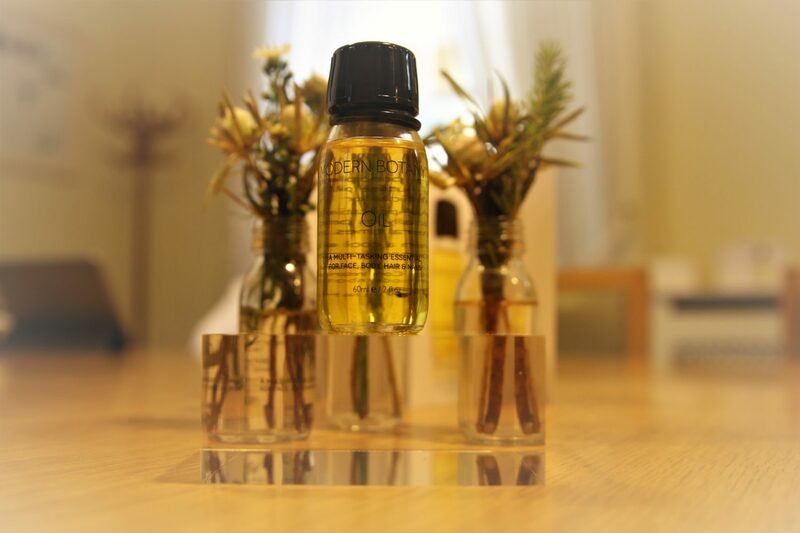 We wanted to develop something 100% natural, completely safe, non toxic, and hypoallergenic.” Launching just as the Asian trend for facial oils began to reach Europe, their timing was impeccable. As John explains, “Many oils claim to be natural, but use silicates. We used crambe seed oil, which contains natural silicates, so you get that slippy, non-greasy feel people want, and we used flaxseed oil as a base, which dries matte so you can use it under makeup, and which also contains oleic and linoleic acids — active anti-aging ingredients. In Japan or South Korea, oils have always been used to seal the skin and keep in moisture,” Simon says. “When they hit Europe, people said, there’s no way I’m putting oil on my skin, but oils are amazing, they absorb straight into the pores, and they regulate sebum production so they don’t give you blemishes,” he explains, as John gives me a well-practiced demo. Tapping a couple of drops into his palm, he rubs his hands to warm and activate the essential oils, cups them over his nose to inhale the chamomile and lavender, then presses, rather than rubs, the oil onto his skin. Once the star of the show, it now shares the limelight with a supporting cast of products: a room fragrance joined the line-up in December, as a precursor to their new natural deodorant spray. “We talked to our customers and asked, ‘what are you worried about? What do you want?’ They said a good, natural deodorant, that smells nice and actually works,” Simon says, and, after 12 months in development, their antiperspirant, deodorant and scent-in-one is hitting the market. With a woody, unisex fragrance, it contains 11 essential oils to kill bacteria and reduce sweating, but most importantly, it’s free from the aluminium salts traditionally used in antiperspirants and, alarmingly, often found — along with paraben — in tissue samples from mastectomies. “The cosmetics market for north America and Europe is 13 billion, it’s huge,” Simon says. “Ireland doesn’t have a big piece of that pie, but we’re hoping to lead the way, and we’re also encouraging farmers to think about growing herbs,” he explains. “We grew chamomile and flax on our two-acre plot in west Cork, and it grew really well. Farmers could be growing alternative crops in Ireland for the health and beauty sector, and it could really be a proper industry here — the climate is amazing for herbs. “We’re asking the question and working with Teagasc on it, but it’s just another project in the background because we have so much time on our hands,” he laughs, acknowledging 2018 is set to be a busy year. A cream and some additional personal care products are on the cards, but these too will be formulated on the principles of multi-tasking, unisex products — all natural, made with the finest ingredients, sustainable, and cruelty free. To that end, their minimal packaging now bears the hallmarks of various certifications they’ve worked to achieve: the Cruelty Free ‘leaping bunny’, the Vegan stamp of approval, and, their latest addition, the Guaranteed Irish ‘G’. Their commitment to quality is steadfast, and every ingredient goes under Simon’s microscope to verify its quality and efficacy — time-consuming but necessary when you’re trying to shake up a multi-billion euro industry from a little shop in Schull. “At the end of the day,” Simon says, “if you develop a product and use second rate ingredients, you just give the natural sector a bad name. What we’re trying to do is bolster that reputation, with fantastic products and ingredients.” So far it’s proving a recipe for success.